Meet Mr. Versatile. Mr. Down For Anything. Mr. If You Can Dish It I Can Take It. Bred to be the ideal weapon for the notoriously rough and muddy cyclocross courses of the Pacific Northwest, confirmed through extensive field testing by PDXTI. Having raced to the podium at events like Sea Otter Classic, Cross Crusade, Skull 120, and Cascadia Super G, our CX bikes take the tradition of excellence initiated by the Ti Cycles STEILACOOM race bikes of the 90s and 00s to the next level. No doubt that on race day the IVAN comes correct, ready to rip gravel and cyclocross courses from start to finish. Top tube routing for full housing cable runs to keep mechanical shifting optimal; Di2 compatible for flawless electronic shifting. Ready to run with 2x11 road/CX groups, drop bar or flat bar 1x, and it is even Gates Carbon Drive™ compatible for single speed ops. Roomy S-bend stays give clearance for big tires and muddy conditions; fits up to 700x40c with a fender or 27.5x2.0. 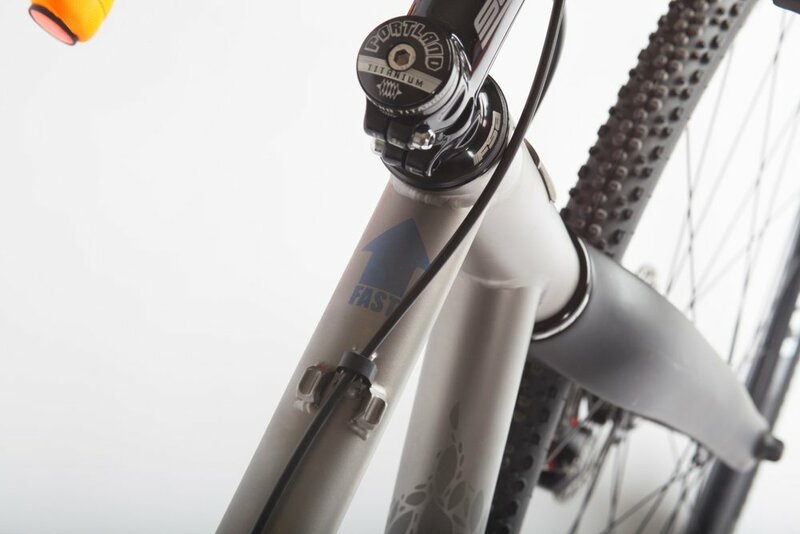 Off the course the bike's performance geometry and predictable handling inspire the confidence to go all-out in any terrain between the bike lane and the trail head. Integrated rack and fender mounts, bosses for three water bottles, and Premier 3Al-2.5V titanium construction means adaptability, durability, and ease of maintenance in all seasons. The modular adjustable rocker dropout system accommodates a range of wheel/hub types, provides proper tension for single speeds, and fine tunes chainstay length for the optimal balance of performance and comfort. Whether clearing barriers and chasing hand-ups or ripping down fire roads on a lightweight bike camping excursion, the IVAN is ready to tackle the path ahead. It is ready to rock a rack and/or fenders if you wan't because life has stuff and nowhere is dry every day. All roads. All seasons. All day long.